If you want peace and tranquillity, then Prospect Cottage fulfills your needs as it is situated in an idyllic setting on the River Wye. Offa's Dyke footpath runs alongside the property and together with the myriad of footpaths in the area it is an ideal base for walkers. Cyclists are also welcome and we have secure parking & storage. All the other attractions of the Wye Valley and the Forest of Dean are within easy reach. . We aim to source locally produced food wherever possible. There are no rooms available at Prospect Cottage for these dates. Children: Children aged 12 or over are welcome. Lesley and Roger are great hosts. You can get bed and breakfast anywhere but they know how to provide a service. Staying at Prospect Cottage really was excellent and the extras around transport, evening meal and packed lunches were so good. 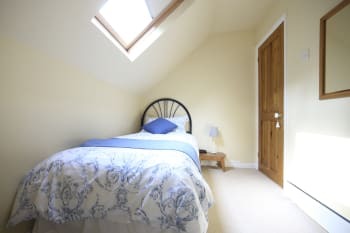 Stay at Prospect Cottage - you wont regret it! Walking Off's Dyke this was an ideal location for our last stop approching Sedbury Cliffs. 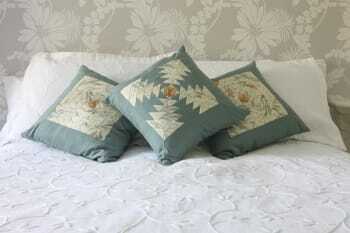 The welcome was warm, beds comfortable and with a guests lounge we were very well catered for. Food also of a high standard. Highly recommencded. Walking up from Sedbury on the lower route about 12 miles. There is access to teh cottage if notified in advance. Many thanks for your positive review. Congratulations on completion of the long distance path. Very friendly and helpful. What a great place to get out and walk from. The Wye Valley is its own advertisement, bgut do go to The Oyster in Newland and to Clearwell Caves. Lovely, friendly welcome (a cup of tea is always welcome to a weary walker)! Great facilities and food (I opted for the evening meal which was a good move); after a restful night and a typical Welsh breakfast I was ready to get back on to the Offa’s Dyke trail which, very conveniently, runs almost besides the house! Thanks again. 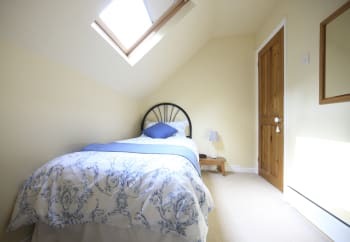 Very friendly household, beautiful setting, comfy bed and guest sitting/dining room, to say nothing of the cool verandah looking over the river, breakfast to set you up for the day and being able to sleep to the sounds of tawny owls after a day's exploring or walking. The accommodations were lovely and our hosts were friendly and welcoming. We had dawdled too much during the day and so were late coming in, but they were watching for us! Great: A surprise in a hidden corner of the Wye Valley. Will hope to go again sometime. We were only en route from South Wales to Norfolk so didn't spend long enough to really makje the most of the place. A sttep slope at the end of a long drive did tax my little 'Up' but it coped. Lovely cottage. Good value for money and excellent evening meal and packed lunch. Lovely house with great views and plenty of space set aside for the use of guests. Our hostess was very helpful in recommending places to go. Breakfasts were delicious. Not ideal if you don’t have your own transport. Beautiful place to stay, quiet, picturesque, just amazing! It’s a great location, serene and green with a lovely balcony to sit and enjoy the views and wildlife. Very comfortable beds and full breakfast. Would recommend this to everyone. Only 5 miles to Tintern Abbey. Very pretty collages and nice pubs/restaurants around. Close to Monmouth and Chepstow. Both worth a visit. We had a lovely relaxed welcome and felt valued as people rather than just paying guests. The BnB is in a fabulous spot ( though the small road up to it is quite long, its well worth it!). Our rooms were love and had all that we needed and breakfast was individually prepared . We enjoyed the company of the other people staying, who we met over breakfast. Would definitely stay again for a relaxing break. The Wye valley is beautiful. Would recommend the Boat at Redbrook, Tintern Abbey and the Old Railway Station tea rooms at Tintern. A tour of Hope Colliery is also great. 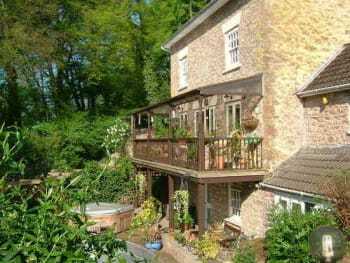 Wonderfully tucked-away spot, with direct access to the beautiful town of Llandogo. Breakfast was good and generous. Hosts were friendly, helpful, and great sources of information about the area. Ostrich Inn has excellent dinner; the Wordsworth Walk around Llandogo is stunning and takes you through the perfect forest; and salmon fishing is everywhere if you have the licence and gear. A beautiful house in idyllic surroundings. 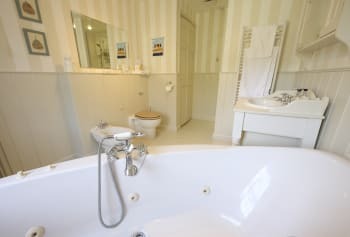 Despite the heatwave that weekend I slept very well in a comfortable bed and appreciated the spacious bathroom. Breakfast was well cooked and elegantly served. None of those irritating individual plastic wrapped milks, jams or butters! The hosts are welcoming without being intrusive. I was attending a family wedding in St Briavels, just a couple of miles up the hill and didn’t go any further than that on this particular visit, but Offas Dyke, Tintern, Monmouth and the delights of the Wye Valley are all within striking distance. We had a great evening at Prospect Cottage at the start of our Offa's Dyke walk. Lesley and Roger were very kind and interesting hosts and we had a delicious dinner sitting outside on the balcony overlooking the river. A perfect setting on such a hot evening, after a long day's walk. The bed was very comfortable, a great breakfast and facilities excellent. Highly recommended! easy to find from offas dyke path, but do have the instructions to find. Warm welcome. Very clean house with nice room and bathroom. Breakfast, packed lunch and dinner were very good. Location on the route of Offa's Dyke Path (route alternative along the Wye-river). There are no facilities for having diner, but Lesley prepared a very nice dinner for us. The welcome was friendly and the food was excellent, as was the accommodation. We carried two of your sticks with us for the rest of the walk and they saved us from drowning in mud! We found it confusing to follow your directions from the river. We did not find Coed-Ithel Weir, perhaps because water levels were so high. When we saw Cleddon we thought we had come too far but, infact, the kissing gate was still two fields beyond that. It may be worth making the directions clearer for walkers. Beautiful setting, but initially rather daunted by condition and length of drive. Got sort of used to it by the end!! Superb stay at Prospect Cottage - really enjoyed it. Sadly, I had to give up the walk the day afterwards, as I needed to get home and visit our local hospital to check out the dog bite. The good news is that it seems fine now. Great location and really nice people. Would highly recommend Prospect Cottage. A warm welcome by the owners. 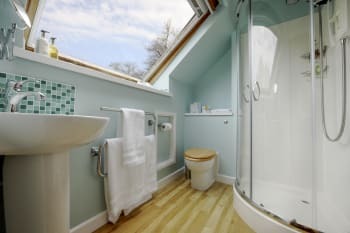 Lovely room with tranquil decor overlooking the river and a huge bathroom. Great cooked breakfast which set us up for our long walk through the beautiful countryside that surrounds the cottage. We walked from the cottage to Tintern Abbey alongside the river which took us about two hours. A few nice places to eat near the Abbey. Lovely place to stay in a beautiful location. Rooms were clean and beds were extremely comfortable. Breakfast was delicious and our hosts were very friendly and great to chat to. Thank you, we will be back! We went for dinner at the very popular Miners in Sling which served really good food and had a nice atmosphere. 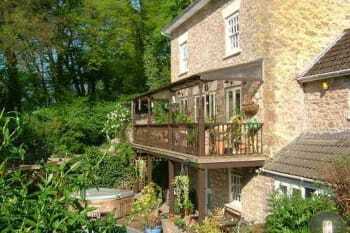 Lovely B&B in a quiet woodland area overlooking the River Wye. Great location for walking or bird-watching. Perfect hosts, who were so very helpful and went the extra mile (and more) to help us on our walk along Offa's Dyke. A lovely welcoming surprise at the end of a long day. Excellent accommodation. Situated directly on Offas Dyke path. Lesley and Geoff were very welcoming and hospitable. Excellent dinner provided as the property is not close to restaurants and we did not have a car. Everything was great! A lovely warm welcome from Lesley and Roger and we really appreciated the pot of tea and delicious cake on arrival. Everything you could need in bedroom, bathroom and guest lounge/veranda. Weather was glorious for our visit and we enjoyed sitting on the veranda to take in the tranquil view. Bed was so comfortable and we actually slept better than we do at home. Very tasty breakfast. Do follow the directions provided by Lesley and Roger; we tried to take a short-cut and it backfired! If you're going into Monmouth, avoid The Punch House - we waited an hour to be served and were given raw chicken and cold curry. Other guests went to The Ostrich and ate well (lucky people). Lesley is a very good host and is very knowledgeable regarding the areas walks/pubs etc lovely location just a few pot holes in track leading to the cottage although we understand this is not the owners responsibility. Go and eat at the Ostrich pub in Newland. 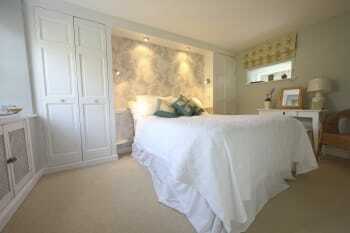 Fantastic location .Bedroom and bathroom beautifully presented ,the bed was so comfortable ! Lesley and Roger were so friendly and helpful and gave us great advice about places to eat . The Miners pub on Mondays is 2 for 1 .Good food from pot luck menu ! Fantastic views of river Severn from Lydney harbour and a good walk by the lock . Gorgeous house in beautiful setting. Great care had been made to provide everything guests might need. Peaceful room overlooking the river. Friendly, chatty hostess. We did a lovely walk to the Devil's Pulpit and canoed with Wye Valley Pursuits. Would recommend both. No just stay at the cottage! We had an evening meal with the hosts, which was tasty and recommended. A very warm and welcoming stay, comfortable room and plentiful breakfast. Symonds Yat and Tintern both worth a visit. Very welcoming and friendly. Relaxed atmosphere. Good breakfast. Comfortable lounge and balcony. Lots of walks. Tintern is a good visit. Walk from Old Station. Very quiet country location. Our hosts were friendly and very helpful. Fireside lounge was ideal for chatting with other guests and exchanging experiences.The only downside for us was the extreme softness of the mattress on our bed. And perhaps a chest of drawers instead of a dressing table would have given useful storage. A very pleasant stay. Thank you. A good base for walking. We could not recommend highly enough! We received the warmest amd friendliest welcome and the home is warm and cosy- the view is out of this world. The room was comfortable and clean, the breakfast delicious and we will definitely be coming again! We loved it, thank you! Friendly welcome, tasty meal, good breakfast and cosy lounge. Many thanks. Clean, comfortable and friendly. Beautiful rural and somewhat isolated location. Be sure to print off the directions before departing. Mobile reception is non-existent. a lovely spot and very welcoming hosts. Comfortable stay, and a great breakfast. Thanks for the packed lunch, it was just the trick. Appreciated the warning about the slippery conditions down into Redbrook, a couple of sticks each helped us manage the way down with no trouble. Great, pleased you enjoyed your short stay. Made to feel welcome. Telephoned local pubs on our arrival to check that they were open for meals that evening. Pointed us in the right direction re things to see and do including local walks. We had a lovely meal at The George, St Briavel. Numerous walks and stunning scenery. 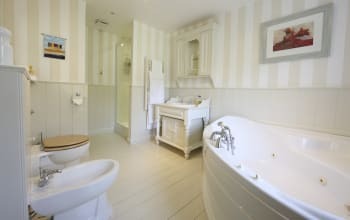 Prospect cottage is the most lovely and comfortable bed and breakfast I have stayed in the UK, and I've been in a few. 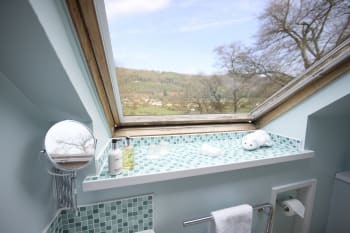 It's ideally located right in the middle of the Wye Valley with gorgeous views. Rooms are very comfy, clean and very nicely decorated. The guest living and dining room are also very nice and cosy. The log stove was particularly nice during our autumn stay. Breakfast was delicicious. Lesley and her husband were very kind and welcoming. They had great tips of which places to visit and what to do around the area. They even booked a table for dinner at the nearby pub for us! 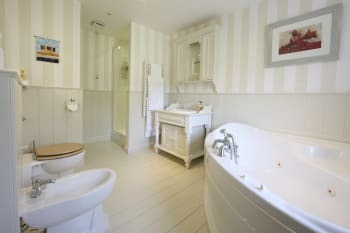 Lesley has definitely thought of every possible detail to make Prospect Cottage a wonderful b&b. Although not the cheapest, it's worth every penny for a great stay. Many thanks for your kind appraisal. It was a pleasure having oversees guests from Peru and Brazil. A fantastic weekend. The B&B facilities are wonderful, the location is inspiring and our hostess welcomed us as friends. Would definitely return. Lesley and her husband are perfect hosts and their home is beautifully situated on Offa's Dyke walk. We had stayed one night in May and we returned for 2 nights in October to complete part of the walk that we missed last time. 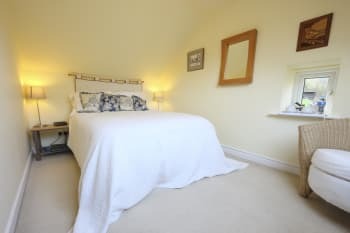 Lesley and her husband transported us to Sedbury Cliffs and Monmouth to start our walks so we could use Prospect Cottage as a base for the first legs of the walk and not have to keep packing up. Lovely breakfast too & tea/coffee making & biscuits in rooms. There are many good pub restaurants in the area that Lesley can advise on. Good spot for bird watching, spring flowers and autumn colours. What a great couple,hospitality and friendliness was second to none,the room was excellent,best sleep iI had in years,.We had an awesome time here thank you for making it so good. Plenty of wildlife around.keep your eyes and ears open for the Owls. We had a fantastic stay at Prospect Cottage. Roger and Lesley were brilliant hosts and made us feel really welcome. The room was really comfortable and we had a lovely view over the river. The cottage is set in a really tranquil location which suited us and seeing the Kingfishers from the balcony was a real highlight. We would definitely stay there again! Only criticism is that the single bedroom was expensive for a room without tea & coffee making facilities or anywhere to put anything - I don't think it had even a hook on the back of the door! The single bedroom is part of The Hudnalls Suite and is priced accordingly. Tea & coffee making facilities are in the double room. Guests booking The Hudnalls Suite are always part of the same party. We can't comment as we only stayed one night but there were many brochures and maps on display and I'm sure the owners would make recommendations. A beautiful location, but along a very rough track for quite a while, and down a steep driveway. Absolutely stunning scenery and a comfortable and spotless place to stay, but be aware that a car is necessary as it is not close walking distance to much. Lovely accommodation in peaceful surroundings. Large lounge with covered balcony with seating available for guests use and breakfast is in here too. Hosts are excellent with interesting historic information thrown in as well. We thoroughly enjoyed our stay. The Anchor at Tintern was good food and with views over the abbey. Glad we discovered our lodgings the first night in the daylight as the private road is quite long with potholes and a couple of forks, just keep right, but not onto Offas dyke footpath! The stay was excellent. I would only say that for a "townie" such as myself a small physical sign on the trackway to Prospect House would provide that little extra confidence that one was on the right path. I can recommend the food and ambience at The George, St. Brievels. Hosts were fab! We never stayed in a B&B before but loved it! Beautiful place with fab host! Best weekend away. Prospect Cottage was absolutely delightful and I would definitely stay in future! Very attentive and helpful hosts but not overbearing. Fantastic location with lovely guest lounge that ha a balcony overlooking river and across the valley. Throughly enjoyed stay and want to return. Phone to get directions as gateway not obvious and long drive with other pathways off. Full directions are on our website. Guests are reminded to download/print these as sat nav is unreliable and mobile phone reception is patchy. Modern luxury in a rustic setting with sublime views over the river and valley. Super clean, super comfy with excellent home cooked food and welcoming hosts. Lovely to welcome you both again. Lovely place run by lovely people. Great view over river with lots of bird life. Well placed for lots of cycling around Wye Valley and Forest of Dean but you have got the mile of track to the main road. Fabulous food at The Ostrich in Newland. Also had a great lunch at Salt and Pepper in main street in Monmouth. Lesley, Roger and pets couldn't have made me feel more at home in their gorgeous home in a stunning location. Make sure you print off the how to get there instructions. Satnav will not get you there. Do nothing Sit on the balcony and feed your soul. The cold compress for my knee was much appreciated as was tea cake and biscuits on arrival. Meal as very nice and Rom clean with comfortable bed,I would definitely recommend you. Very welcoming and friendly owners. Like a home from home. Lovely breakfasts with wonderful homemade greengage jam. 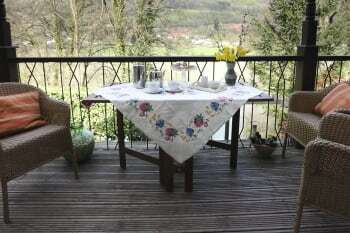 Great to have a welcome cuppa and biscuits on the balcony looking over the river Wye. Enjoyed relaxing in the guest lounge which has a great view over the valley.Thanks to Roger for taking us to Chepstow to walk back along Offas Dyke to the B and B. Altogether we had a great stay at prospect cottage and felt very comfortable and at home there. We would definatly go back. Great local pubs serving very tasty hearty food in St.Briavals and Newland. Endless options for walking. Canoeing the river Wye. Wildlife. Clearwell caves. An area where you feel like you've stepped back in time. What a super b&b, perfect place for some down time. Lesley and Roger were perfect hosts , we arrived as guests and felt that we left as friends! Our room was so pretty and the views wonderful. There was plenty of info about the area and on good places to eat. Lesley cooked us the most scrummy breakfasts. Would loved to have stayed longer than three nights and will be returning as soon as we are able. We thoroughly enjoyed our stay at Prospect Cottage. The location is peaceful and idyllic. Lesley and Roger are friendly and helpful, with excellent local knowledge. We hope to come again. Thank you for awonderful break. There are lots of wonderful walks from easy rambles to more challenging paths. Follow the recommendations for local pubs. Beautiful, peaceful location overlooking the Wye Valley - and lovely patio to enjoy this from and bask in the evening sun. Very friendly welcome, and excellent food if you're starting/finishing Offa's Dyke. Sorry, as I was walking Offa's Dyke I didn't manage to explore anywhere else! Brilliant in all services, definitely planning another stay. Perfect for walking on the Wye Valley. Very relaxed stay with a very warm welcome from Lesley and Roger.